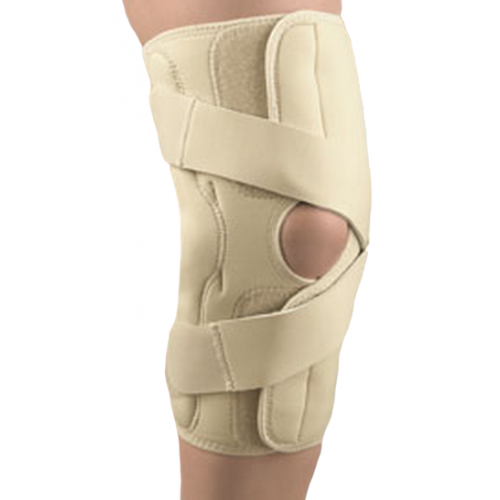 Safe-T-Sport® Lateral Knee Stabilizer, manufactured by FLA Orthopedics, provides excellent side-to-side support of the knee and stabilization of the kneecap. The tubular "J" shaped buttress maintains proper alignment of the patella and provides lateral side support and stabilization. Flexible spiral stays provide medial and lateral stability while maintaining full range of motion. Constructed of sports neoprene with a soft long-loop nylon lining for therapeutic and soothing warmth. 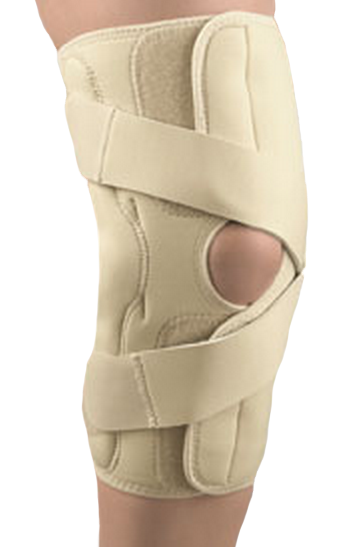 The adjustable support straps provide an adjustable amount of compression and increased stability. A seamless feel in a tapered sleeve, slip-on style. If you need a simple knee compression sleeve check out the Leader Knee Compression Support or for a brace that can be used on the knees, ankles, or elbows check out the 360 Degree Therapy Brace (3-In-1). Side-to-side support for the knee, and stabilization for the kneecap. Available for both the left or right knee. Neoprene sleeve with soft, long-loop nylon lining. Measure around leg 4 inches above center of kneecap. the picture shows beige but the description says black. Can you confirm what color this is? We've updated the description to include the correct color. We apologize for the confusion.